Emerging during the Mid-Miocene approximately 15 million years ago, the unique member of the rhino family in North America known as Teleoceras, thrived until the very earliest stage of the Pliocene. Think of this creature as a rhino in a hippopotamus' body. This type of rhino was much different in body mass and profile than the modern rhinoceros of today. With its very long and stout body supported upon short, stumpy legs, it is likely that the belly of Teleoceras would have nearly reached the ground. Another notable feature is a single, small conical nasal horn that is present only in males. Believed by some to have had an aquatic life-style based on its awkward body, the complex and high-crowned nature of Teleoceras teeth suggest a grazing diet. Studies performed on the carbon isotopes in the enamel of fossil teeth further support this claim. Several genera of rhinocerotids once populated North America during the Late Eocene and Oligocene Periods. Their extinctions were followed by independent migrations of three Miocene groups from Eurasia in the Miocene. 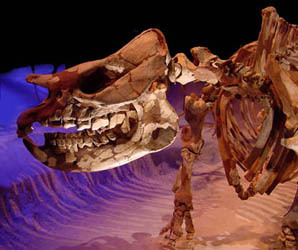 Teleoceras fossils have also been found in Asia, Europe and Africa.